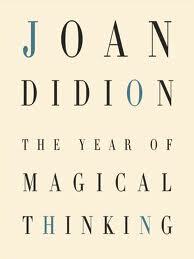 Joan Didion’s The Year of Magical Thinking is, I suspect, a milestone in the literature of grief. Not being familiar with the literature I assume it must be so; for hardly can I image a more braided, tangled, yet orderly assembly of emotions and observations. Delivered by a masterful voice that is always careful and precise, this book is the account of Didion’s year following the death of her husband, the novelist John Gregory Dunne. A great deal has been written about this book. I do not need to try my hand at the turning the wheel too. But there are couple of things about it that affected me deeply. (This is after all, a blogg entry, not a book review. Liberty is mine to exercise.) To wit: I love the account of marriage that Didion relates late in the book. This is not so much an account of grief as it is the painstaking effort to rise for celebration. I read this passage aloud to Carole and thought long on the truth of it: the patterns that a long marriage ingrain in two people, such that they anticipate and know in unspoken ways; and when the pattern is broken, as is the pattern that was Didion and Dunne, the troubles that arise from the depths cannot be entirely fathomed. But Didion is a “cool customer” –such was the phrase used by her social worker, meeting after the arrival of Dunne’s body at the hospital. She is a writer after all, among the best of writers. So precise is her writing, her account, that indeed she must be the coolest of customers. I thought of Diane Arbus photographing her dead father toward the end of this book. Arbus loved her father. Didion loved her husband. But genius is a constant and turns in untold manner and direction. And that is the other thing I like so much about this book: Didion is passionate about her subject. She pains to understand what happened in her living room that December night, 2003. And does she? When all is said and done, does she understand anything? I think not. But that is not a shortcoming of the book, of her, or of this reader. For really, what can anyone understand about death? Nothing. Nothing at all. Thanks for the book recs, Doug. More musings, please!